Lettuce production in the past years has seen a multifold increase, thanks to Hydroponic Lettuce Production systems. Through Hydroponic Lettuce production, the produce is more predicatable, clean and hygienic and also uniform in terms of appearance and taste. 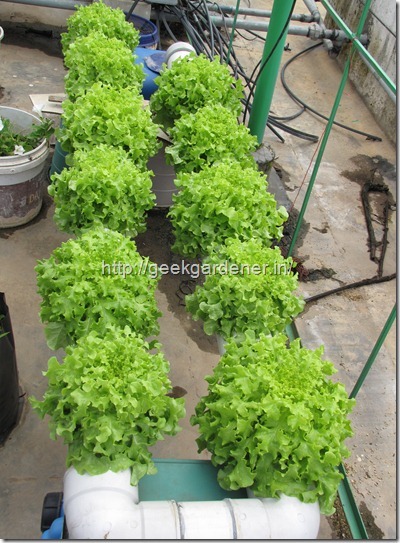 Learn about Hydroponic Lettuce Production in this post and grow lettuce that is amazing to taste. 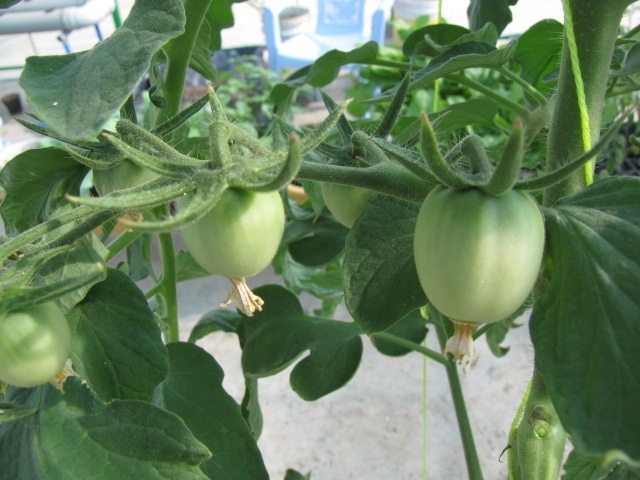 Hydroponics is a science in which plants are grown in water that contains all the essential nutrients necessary for the plants to grow, flower and fruit. While the name ‘Hydroponics’ refers to growing plants in water, practically speaking it is not always the case. Hydroponics nowadays simply means growing in a media that is inert and lets the grower provide all the nutrients required. It is also known as soil-less culture. 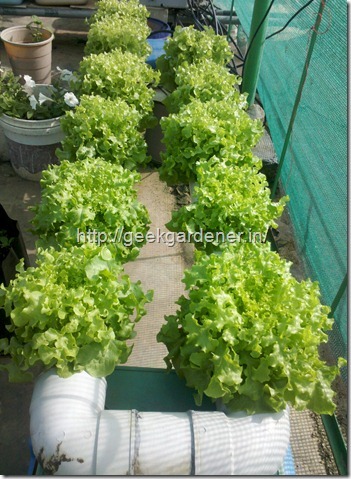 There are variety of media that are used for hydroponic culture. Some of them are cocopeat, rockwool, perlite, expanded clay, sand, gravel, vermiculite, rice husk etc. There are lot of material in the internet. I recommend the following book if you want to learn about hydroponics. 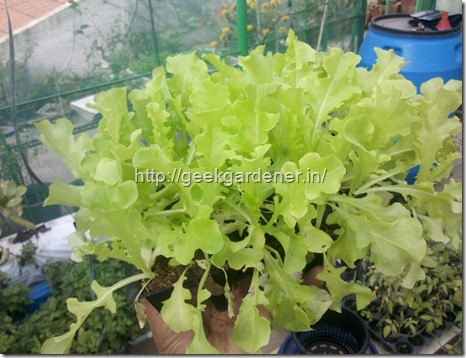 In this post, we are going to focus only on growing lettuce in NFT/DFT. In Nutrient Film Technique , a thin film of water continuously flows through the pipe/gutter always being in contact with the root. This ensures constant availability of nutrients to the plant and also ample oxygen since the root are exposed above the thin film. Since it is a very thin film, there is no stagnant water at all. This system requires the nutrient solution to be continuously in circulation. This translates to the pump being always on. In our condition with frequent power cuts, that is just not possible at all. If the pump fails, the system immediately runs dry. Deep Flow Technique, on the contrary always has some amount of nutrient solution (NS) at some depth. More nutrient is periodically pumped in and through the overflow pipe the excess NS goes back to the reservoir. Even when there is a power outage, there is always some amount of water to keep the plants alive. So naturally, I chose this method to grow lettuce in it. 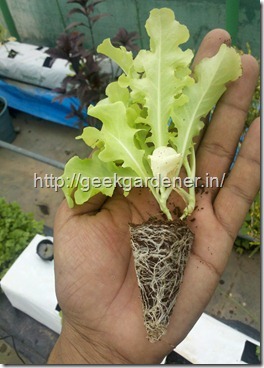 I had grown lettuce in pots before using cocopeat as a medium and got very good results. Always wanted to grow in NFT/DFT to compare the results and the timing was just right. The variety of lettuce I chose was “Green Salad Bowl”. 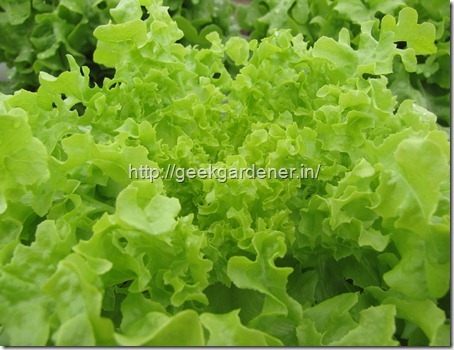 The seeds used were saved from the previous batch of lettuce. Needless to say, germinating/seed starting them was a breeze. Good lettuce seeds germinate in 3 days. Lettuce seeds need sunlight to germinate. A common mistake is burying them with media. Usually they will germinate, but it will be sparse. Take good quality potting media. 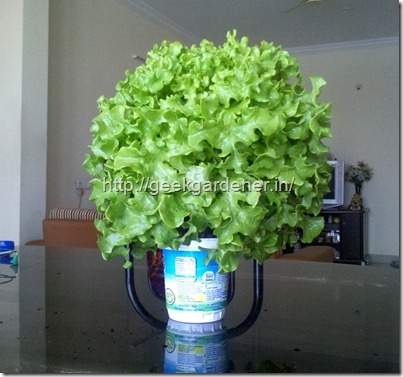 For hydroponics, using just cocopeat is fine. Moisten the cocopeat in such a way if you squeeze the peat it gives out very little water and when you open your hands, the cocopeat remains as it was and doesn’t fall apart. Make tiny pits in the cocopeat where the seeds will be sown. Sow two seeds per cell. Gently press the seed on the surface of the mix such that a portion of it is visible. Cover the tray with transparent/translucent polythene bag. Keep checking for signs of germination. The moment you see a green sprout coming out, remove the cover and keep it in a bright place. DO NOT KEEP IT COVERED after the germination. It will lead to leggy seedlings. 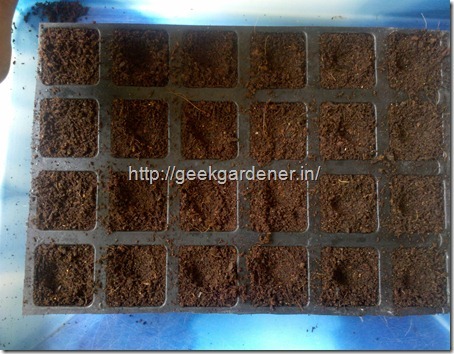 Sowing two per cell makes up for the seeds that wont germinate. Sunlight and nutrients are very essential after the true leaf emerges. For seedlings, half strength nutrient solution is recommended. Since they are very tender, higher concentration might actually burn the root. Half strength 19-19-19 is good enough to raise transplants. About two weeks later, the seedlings are well grown and are ready for transplant. 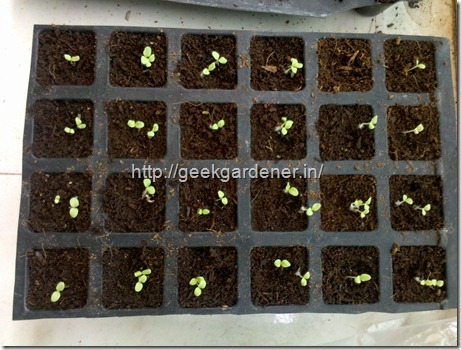 Infact, they have overgrown in that small seedling tray. I was out for 3-4 days during that time and they remained in the cell longer than they should. Now is the time for transplant. 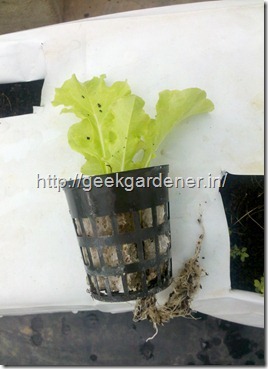 The picture to the left below, is the transplant and to the right is the lettuce seedling planted in a net pot. Ideally the netpot is filled with a coarse media so that it doesn’t fall into the pipe. But materials like hydroton are not available easily and they are quite expensive as well. So a little customization was done. The netpot is approx 2″ dia (I think). 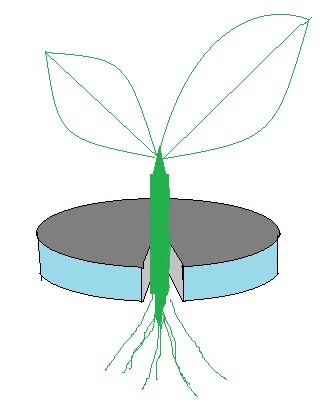 In the bottom, I made a hole so that the root of the plant can pass through it and come out. Next, I take the transplant from the cell, wash off the cocopeat with running water. Take a piece of styrofoam and cut it to make a circular disc. Now cut a small pie out of it. Hopefully the following picture makes sense. Pardon my drawing skills. All this styrofoam gymnastics is to keep the plant intact in the netpot and it also stops light from entering. Filling the netpot with cocopeat is not a good idea. One can fill it with coco husk chips. Usually the sides of the netpots are for roots to come out but in our setup the netpot is to simply anchor the plant in the pipe. Now comes the main part of the system. The PVC pipe. This is literally the back bone of the system. The pipe chosen for this is a 4″ dia PVC pipe. Holes of 2.5″ dia were drilled using a hole saw cutter in order to house the netpots. This is made in shape of a U but it needn’t be the same way. One can have a single long pipe and that should do well . Ensure the endcaps are sealed well and there is no leakage. The pipe should be properly leveled such that there is no slope. Remember this is DFT. We don’t need slope here. One of the two end caps has an outlet through which the water flows out. At any point, there is always 2-2.5″ of nutrient solution present in the pipe. Anything more than that pumped in automatically overflows into the reservoir. Check out one of the pictures below for the picture of the overflow pipe. It can be kept in the side or in the bottom also. In case of placing it in the bottom, ensure a depth of 2.5″ of nutrient solution is maintained. Now that the pipe and the transplants are ready, it is just a matter of fitting them in. No digging, etc.Fill the pipe with enough nutrient solution and Just snap the pots in. Nice eh? With the help of a timer, the nutrient solution is periodically circulated in order to not cause any oxygen depletion. The pH and the EC was also continuously monitored to maintain the conducive environment. It can be seen from the below picture. NS enters via the black tube at the top left into a hole and comes out on the other end and drops into the reservoir from a height. The turbulence and splash causes airbubbles to mix with water there by causing oxygenation. Considerable growth is observed after 10 days of transplant. Slowly they are starting to fill the pipe. Twenty days after transplant and they are already looking gorgeous. Everyone who saw this had a big “Wow”. The inlet and the outlet holes are clearly visible in the picture below. The same setup from the other side of the pipe. Uniform growth and the growth rate was phenomenal. Every day I could see great improvements in size. At this point, the lettuce has reached its final size. Trust me the picture doesn’t do justice. 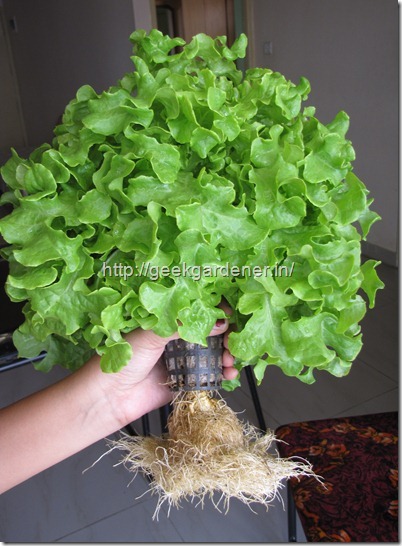 Each lettuce plant looks like a big ball of leaves and is too much for two people to consume. One bunch has enough leaves for a salad for 3-4 people. The market lettuce I saw recently was a small bunch at a crazy price. The variety stands to its reputation. Green Salad bowl. With frills and curves in the leaves, it is an attraction by itself in my garden. Reached their final size or Did they? Check out the white roots. Everytime I check the plants, I focus on the roots first. It is very important to check on the roots. If the roots are brown that is an indication that they are not getting enough oxygen. In this situation, no matter how much nutrients you put the plant just cannot take it. After the harvest, I weighed the lettuce first. It came to about 260-280 on an average.With some modifications to the system, increase in the weight can also be achieved. The water quality is also important. The water source I have is hard water and the nutrients had to be tailored for the same. Though this post is complete, there is more to be written on growing lettuce in the coming posts. 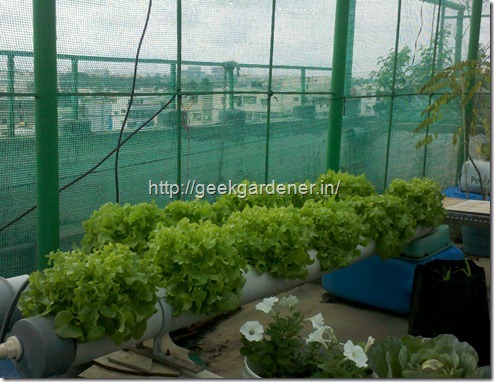 With the information on Hydroponic Lettuce Production, you can start growing lettuce in hydroponic systems in your garden. This post is about how to grow lettuce/salad crops using hydroponic methods such as Nutrient Film Technique (NFT) and DFT. NFT stands for Nutrient Film Technique. 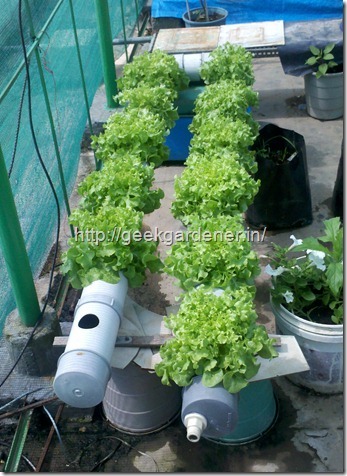 It uses hydroponic nutrients circulating through the pipe and the plants are placed in net pots. My lettuce never germinated and I think now I know why? Awesome post. Superb as usual. I have a question regarding fertilizers available in market. I saw small light brown granules sold as fertilizer. what is that? What is slow release fertilizer? where we get that in bangalore? I want to prepare some beautiful hanging baskets (wired baskets). What thing can be used in that as lining? I saw Andrew Moss is being used as lining in videos. Is this available in bangalore? so many questions? 🙂 🙂 .. cant help it !! 2. What other crops could be grown in this set up. How about putting in the details of the Kit in the blog post itself, in case you do have time to respond to individual mails. This is brilliant. Keep it up, you’re taking a leap here. Please let me know which nutrients were used. 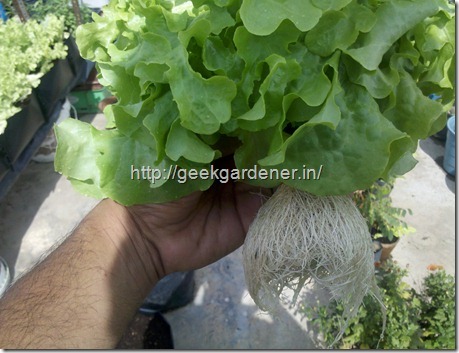 This is really nice post for growin lettuce which I wish to grow in pot.Where can I get these lettuce seeds ? Also I see you grow vegetables on terrace Can you post how to start/maintain a garden( veg or flower) ? Why is that green net ? Is it overhead ? Congratulations for the NFT/DFT setup..
Can you please share the hard water nutrient formula used here? which other plants you believe can be grown with this system?? Wow! Those are wonderfully looking lettuce! Hopefully, I can grow that variety using non-circulating hydroponics. 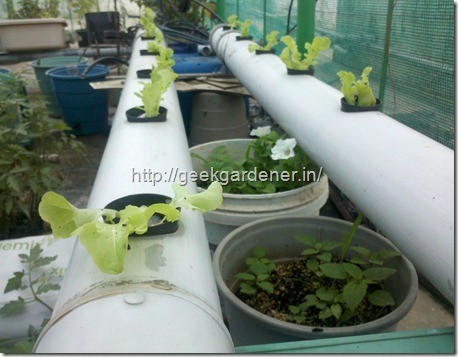 Did you make the hydroponics solutions yourself? Do you sell them? Or can you let me know where you bought them? Really amazing growth you have on those lettuces, would have liked to see a pic of the seedling in the styrofoam before you put in the net pot. I was trying to find out when exactly you move the seedling from the cube to the net pot. Do you water the root off the cube stuff, and then plainly hang the seedling? Or do you hang the whole thing there? Gorgeous Lettuce! Congrats on making the news today btw! Saw an article on you and your blog in TOI. We have been struggling to get the nft nutrient formula rite for our new hydroponic commercial setup would appreciate if you could revert back on 9967824444. Great job, GG. 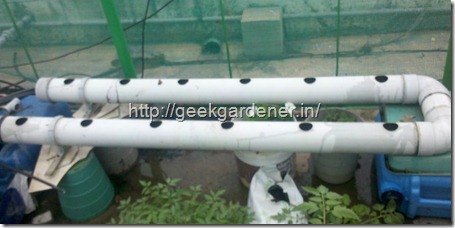 Both the growing in Hydroponics as well as the post. But come to think of it….which one was better? No I can’t tell. Well few question crop up during the reading. 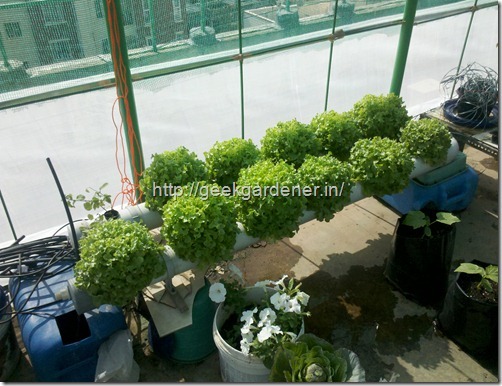 Can Hydroponics be done 100% organically? I would like to do this commercially do you think it is viable? Thanks in advance. Can you pls help me identify what EC you maintain for your nutrient and what air temp you grow in? which nutrient you are using? Spacing between two lettuce plants? do you use a fan to oscillate the air around the plants? Water flow is continuous (you do not want stagnant water as it will drown the roots and cause anaerobic bacteria to take over). There is always water in the pipes, even when the electricity is not present. You can use a submersible pump (400l/h to 1000l/h). Could you also help us with the nutrient solution and in what strength were they fed to the plants during the 2 months timeframe? What are the ingredients for nutrient solution and their concentration? Is there any difference in the composition of NFT and DFT? Nice informative post. Can u inform us what nutrient solution u use. 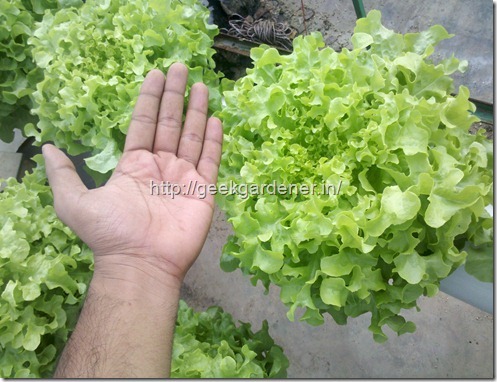 I am based in coimbatore i planning to grow so i need to buy nutrient solution. Also do you have any solution to maintain ph. How did you determine how much nutrients are present in your water before adding the salts? Is there a way to get TDS count for individual minerals present in the tap water. Very Intresting, DO you have some recommendation for an alternative to PVC, as you know PVC has many cancer causing chemicals which leech to water over time. I am looking for an alternative which is as versatile as a PVC. Thanks for bringing light to this. I have a question .I want to know the difference in nutrients present in a lettuce grown in mud VS lettuce grown in an acquaponic /hydroponic situation.What would be the nutritional deficiency (if any) in case of a hydroponic farm produce(of any kind – cucumber,lettuce,cabbage etc). Have you ever tested/compared the farm produce under both the system (acquaponic VS normal pot gardening) in any lab? Thank you for your efforts. Everything is very useful. If possible one clarification: Please explain in few words about periodic circulation of nutrient solution using a timer. May i know what is the distance/length between each hole saw? Normally the maximum temperature in our area will be 36 to 39 degrees during summer. Is there any upper limit for heatlthy growth of this plant? Great! is this an outdoor hydroponics?. i wonder what is your temperature in there because ive been growing lettuce in the city and its hot which result in it bolting early.. what is your secret? This is outdoor ( with a shade cloth). IIRC, I grew that batch of lettuce (green salad bowl) when the weather was really cool ( Nov-Dec). The best temp is between 18-24 deg C. You can also chill the reservoir to this temp range to reduce the chances of bolting.